Transfer EDI and digital commerce data directly to UPS, FedEx, Endicia, USPS and many more. Moving data from the system that manages your orders to another shipping application not only promotes errors, it costs you time. And time is money. Copy-and-Paste. Copy-and-Paste. Copy-and-Paste. Wouldn’t you love to do less of that? You can with Lingo, because the tracking numbers automatically transfer between Shipments (ASNs), Invoices and other documents you use. Go Ahead And Label Us. As long as you label us smart. With Lingo, data is automatically transferred when you need to create labels for FedEx and UPS. 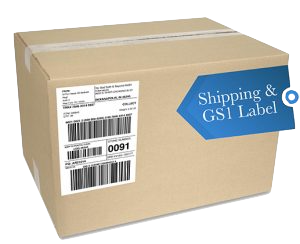 If you ship to Bed Bath & Beyond with FedEx, you can even print one label with both the GS1-128 and shipping information. Order handled? Label created? Let us print it for you and get it to your fulfillment provider. One less task for you or someone else — and more time to sell products. FedEx delivers in a hurry. Move your EDI and online order information even faster than that. Create shipping labels for FedEx in an instant without ever leaving our Lingo software. You’ll save all kinds of time when you don’t have to switch to the FedEx shipping application, and you’ll be able do everything in just a few key strokes. EDI, online order data, and UPS. It’s time to mingle. You have your EDI and online order information all in one place. But now that it’s time to ship, you need to get it to UPS. But you can avoid switching to the UPS application and manually entering data — you’ll be able to prepare labels with the information that’s already in Lingo. What’s more, you’ll be able to do it in just a few key strokes and without the errors that manual entry can create. Amazon, Endicia, OnTrac, stamps.com — connect directly to all of them. In this ever-changing retail environment, orders come through all kinds of channels. That often means shipping in multiple ways. Relax. We have you covered with direct connections to Amazon, Indicia, stamps.com, and OnTrac. There’s no need to manually enter order information — count on Lingo to merge it automatically and error-free. Make a GS1-128 as quickly as a UPS or FedEx shipping label. From the time an order comes in until the moment a label goes on a package, our approach to EDI and online orders can cover the entire process. When you begin working with us, we’ll create a custom solution that integrates your transaction information with FedEx and UPS so you can create shipping and GS1-128 labels at the same time. And with just a few key strokes. One integrated label gets it to Bed Bath & Beyond. If you ship products to Bed Bath & Beyond with FedEx, we offer a way to combine shipping details and GS1-128 information into a single label. So it’s as easy as Print, Stick, and Ship.